Kim Freeman studied the psychology of lost cat behavior (yes, it exist) and has become the national expert in the very specialized, and in-demand field of lost cat recovery. 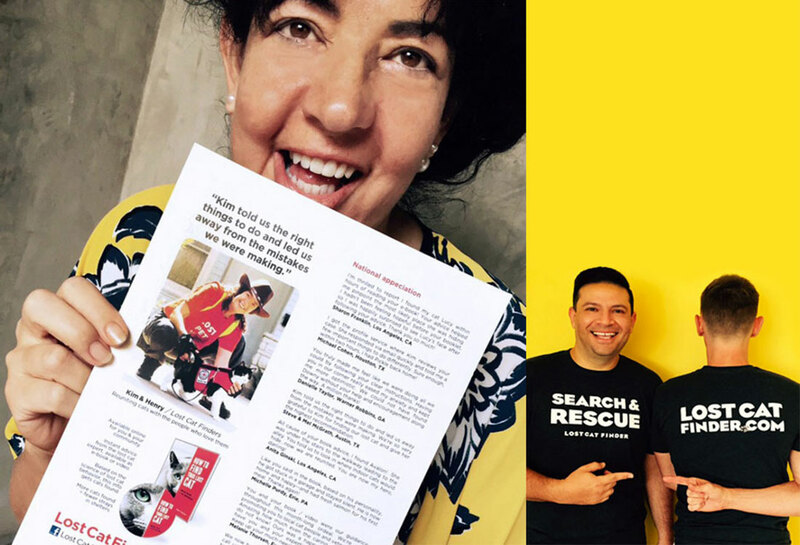 When she needed her business to be found, Lost Cat Finder, she turned to the creatives at CIHYA for the right design and visibility to get noticed. We made her site name into her logo to instantly communicate her specialty. The font is friendly yet bold so it can be both fun and serious at the same time. We added the paw to lighten the intensity for those currently looking for their lost cat. For her branding, we created cool, comfortable and stylish T-Shirts to be worn on the job as well as for daily errands to achieve maximum branding coverage for Kim and her company. Car magnets, labels for cat training “clickers” and the cover for her instant Tips booklet/video go out to help cat owners all over the world. Kim could not be more proud of her company and the logo she stands behind. Discover the power of effective branding and have consumers find your business and services. Give us a shout and lets collaborate on something great.